I've posted many small do-it-yourself(DIY) projects here on the blog over the last year and a half. The key word here being small. I'm not a DIY kind of person, believe it or not. Creative and a little crafty? Sure, but I'm just not into big DIY projects. I'm quite happy letting someone else install my new floors, thanks. I do love DIY projects if I can do it cheaply and I know what I am doing OR I can google it and figure it out in 15 minutes. Time is money. Many times I don't have either, but I figure it would take me just as much money to build a dresser as it would to buy one. And I wouldn't have a life until it was finished. Not only do I want to save time and money with my projects, but I want to save resources. Recycling things is a great way to do that! And my absolute favorite DIY project to work recycling magic on? A project that is easy, fast, and cheap? One of my favoritest things ever? I. love. pillows. Hubby wishes I didn't. A girl can never have enough pillows! Pillows can be expensive though so I love making my own from old things or by repurposing new things. 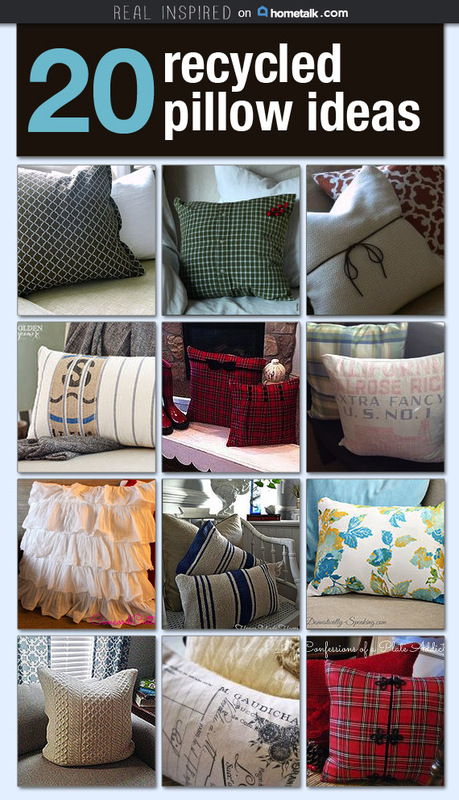 I just finished putting together a recycled pillow idea board on Hometalk so I can keep track of new ideas! If you haven't heard of it, Hometalk is similar to Pinterest only it's all home and garden. It's amazing! You can share your own projects or ask questions of the Hometalk community. You can follow Real Inspired on Hometalk and see the board by clicking the link or the picture below. I'd love to hear your thoughts on these ideas! Which ones are your favorites? Do you have a massive pillow stash like me?